HurricanecCity.com has been mentioned on television, newspapers, magazines & news websites. The following organizations have recognized HurricaneCity.com as a worthwhile site to visit for information and tracking. These are just some of the many mentions listed in alphabetical order. We would like to thank these individuals & organizations. The Advisor a Gannett company posted a story on May31st,2015 titled "5 things about hurricanes you may not know" mentions hurricanecity stats from database. Click here to read the story. AllHeadlineNews.com is where the nation's newspapers gather news stories throughout the day. Before the 2005 season started, writer Douglas Maher interviewed Jim Williams about hurricanes. Click here to read the story. You can also click on the image to the right for the interview. In May of 2005 Bay News 9 television had HurricaneCity on "Extra on the Web". Bay News 9's Al Ruechel has HurricaneCity as a website you'll want to check out. HurricaneCity was featured on the 6PM newscast in Tampa. Click here for the video. Bryan Norcross wrote a column for the Sun-sentinel newspaper in the 1990s in Ft. Lauderdale called "Ask Bryan Why". He is also famous for talking people through Hurricane Andrew in 1992. On December 6th, 1999 Bryan responded to a question asking how many Hurricanes have hit Tampa in which he suggested go to the Tampa page in the database at HurricaneCity. Bryan also has worked for the CBS Morning Show, the local South Florida CBS affiliate and The Weather Channel. Click the image to read. 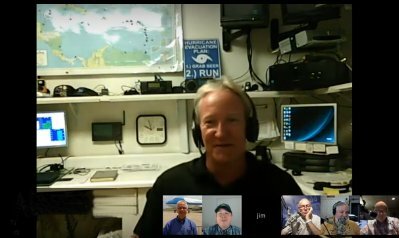 On May 31st,2017 Jim Williams was on the Carolina Weather Group live show to discuss the upcoming hurricane season. On June 13th, 2005 after coverage of Tropical Storm Arlene, HurricaneCity was mentioned by Channel 13 news in the Orlando area. Al Ruechel said the site does a pretty good job collecting some rather unusual resources that kick in once a big storm has formed anywhere in the Atlantic. On September 5th, 2002 this channel mentioned HurricaneCity & it's many uses. They like the message board as well as the radio station links. Click the image to right to view the article. Meteorologist John Gaughan surfs the web every weekday morning on the "Daybreak Show". On June 4th, 2001 John talked about HurricaneCity.com as one of his favorites. He is another meteorologist that likes to use the HurricaneCity Database which gives detailed analysis for 150 cities in the Atlantic basin for effects from tropical systems. John takes hurricanes very seriously & more meteorologists like him are needed. Jacksonville is fortunate to have him. Click on the picture to read. "At the beginning of the 2016 hurricane season CNN produced a video about hurricane season showing statistics.They referenced the HC database to find Cape Hatteras gets hit by more storms than anywhere else in the basin. In 1999, Steven Lomax reviewed websites that cater to hurricane trackers. He called the site gaudy but impressive. Steven seems to really get what HurricaneCity is all about. Getting as close to the storm as possible! "America's best newsletter". This political website for news mentioned HurricaneCity as "the website of the day". This was done during Hurricane Charley in 2004 as we got a ton of visitors from the listing. Click the small image to the right to see the listing. "Energy Consumers of the Carolinas news website". In August of 2018 Blogger Scott Carlberg talks about the threat to the Carolinas on a regular basis using the hurricanecity database statistics. "Fivethirtyeight news website". This polling aggregation website by parent company ESPN sports is based in New York and was launched in 2008 with a blog created by analyst Nate Silver. On September 24th,2015 author Matt Lanza wrote a story on "People moving to coast amid lull in hurricanes". The title basically tells you what this story is about but some of his research was doing using the HC database. "Using data from the website hurricanecity.com, I determined the most recent year in which the strongest part of a hurricane of any intensity affected each coastal MSA from Texas to Maine". Click the image to the right to read the entire story "jpg",hurricanecity.com mention down in references at the bottom. The Florida times union website Jacksonville.com did a story in March of 2012 about a wife luerd by St Simons Island,Georgia. The couple found hurricanecity.com to reseach the area in the database and found it does not get affected very often by hurricanes. 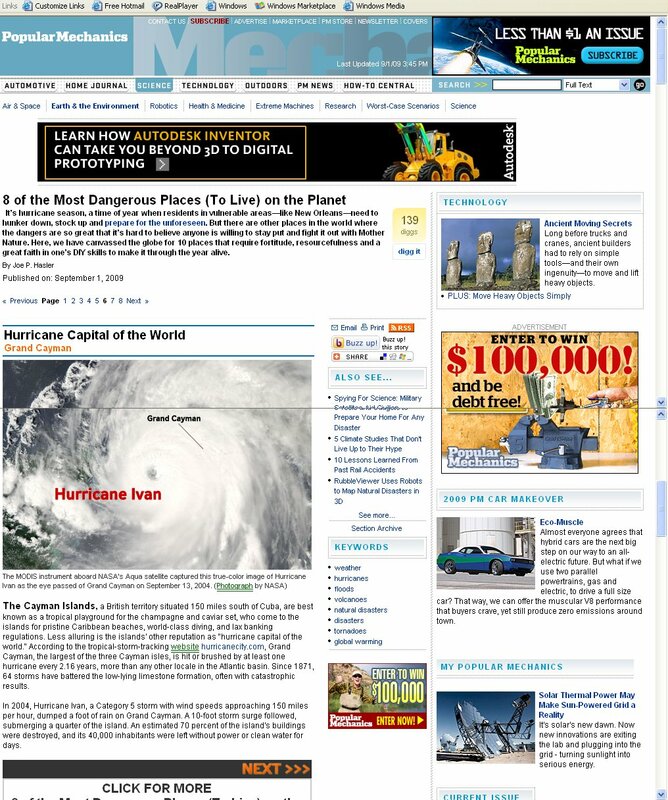 In September of 2006, the Weekly Gambit featured a story on HurricaneCity.com. This was the hurricane season following the 2005 season where Hurricane Katrina caused historic damage to New Orleans. This was a nice article talking about most of the products produced by HurricaneCity and how you get so much more out of the site compared to mainstream media websites. Click on the image to the right to read the whole story. The Hurricane Research Division, located in Miami, is dedicated to understanding more about hurricanes. Many people use this website to gather statistics on past Hurricanes. The research division has decided to add HurricaneCity to a few of it's searches for statistical, as well as news, information on hurricanes. Being listed here speaks for itself, as these are the true hurricane experts. Click the image to the right to see just one of the listings. From best bets on the web, mentioned on August 15th, 2004. Mentions the live audio available on the website. Click the small image to the right to see the listing. Hurricanecity is listed as a source for hurricane information along with "the weather channel" "Accuweather" "Intellicast" and "weather underground". Click the image to the right to seea screen shot of the weather page. 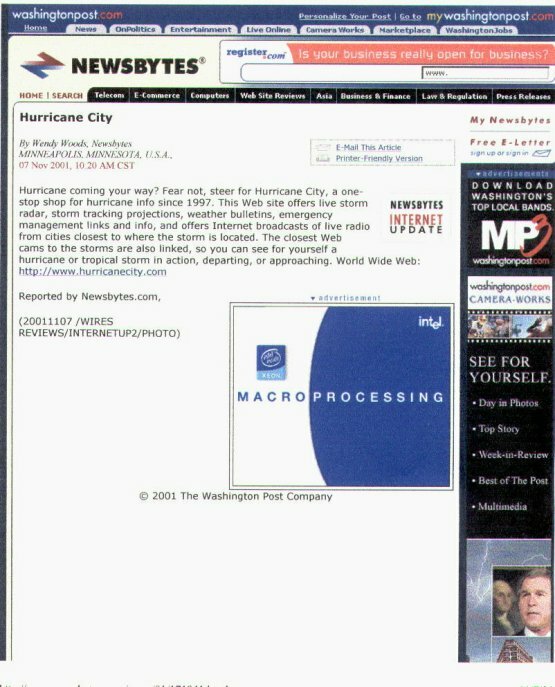 During MSNBCs' coverage of Hurricane Floyd in 1999, the station covered the internet angle of things. Internet correspondent Lisa Napoli talked about HurricaneCity.com & the wealth of information concerning Hurricane Floyd. She paid particular attention to the audio & radio station part of the site as she said "HurricaneCity is making this a seamless experience with a lot of information, and it's almost like being there". Click on the MSNBC logo to watch the video. While tracking Hurricane Rita in September 2005, cover producer Josh Belzman did a story on not just using NOAA websites to track hurricanes. Read the article here. On MSN's Money Central under Planning & Insurance, HurricaneCity was mentioned. They were referencing the HurricaneCity database where you can find out how often certain cities get hit based on climatology. Click the image to read the story. This monthly distributed magazine has a readership audience that spends an average of 82 minutes reading each issue, which according to this magazine is much higher than most other magazines. The September 1999 Issue had a story called "Ocean Tantrums" discussing the increased activity and the threat to land from hurricanes. HurricaneCity.com was mentioned as the site to go to for hurricane tracking information sandwiched between the National Hurricane Center site & The Hurricane Research Division site. Not bad company at all. Click the image to read . This science magazine writes articles about the the top websites in science. On November 2nd, 2001 the site magazine discusses HurricaneCity.com in a mostly positive way. They did mention how the site has an unattractive look & cluttered with advertising but is worth exploring in spite of that weakness. Come on people, a wealth of information does not come without cost. Click on the image to read. The NOAA Hurricane Hunters fly into hurricanes to gather additional data for modeling hurricanes future paths. These dangerous missions allow NHC to see how strong a system is to see if it is strengthening or weakening. We use the products they issue at hurricanecity via our maps so we are happy they link back to hurricanecity. This large newspaper is distributed in Palm Beach and the Gold Coast of Florida. 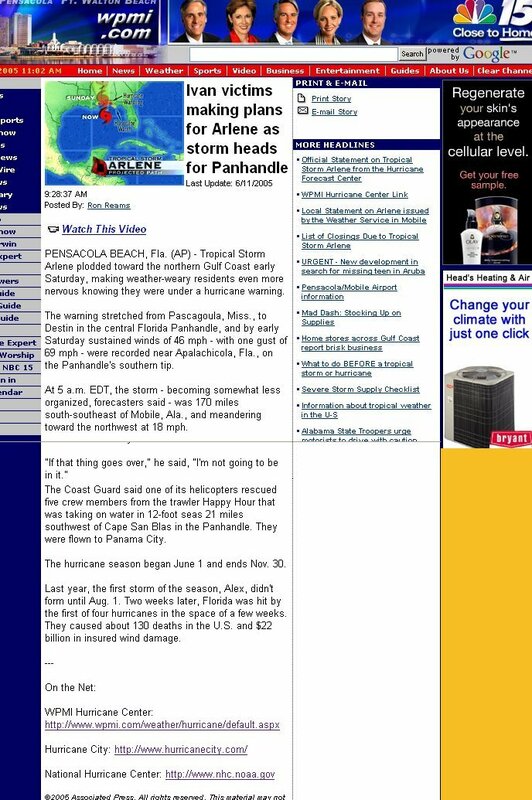 On August 7th, 2006 this paper did a story on Hurricane Trackers throughout the country. A lot of these guys put a lot of time and money into these projects, so the story was well deserved. This Broward county magazine did a story on jim's hurricane season predictions back in 2008. Jim's #1 pick was hit as St Martin and #5 Vero beach were both hit during the season too bad they never followed up. This local paper did a story on Jim Williams in September 2007 and about how he started HurricaneCity.com. Click to the right for story. This local paper interviews Jim Williams about Palm Beaches history in May 2011. The Daytona news journal newspaper got into the discussion of is the Daytona area due for a hurricane before the season started in 2013. Unfortunately they got the stats wrong on a couple of locations but the point drives home the differences of opinion on what the stats mean. This magazine did a story on the HurricaneCity ranking of the Cayman Islands being the most affected area in the Atlantic basin.The story was written on September 1st, 2009 and titled "8 of the Most Dangerous Places (To Live) on the Planet". Click the image to the right to get the headline. 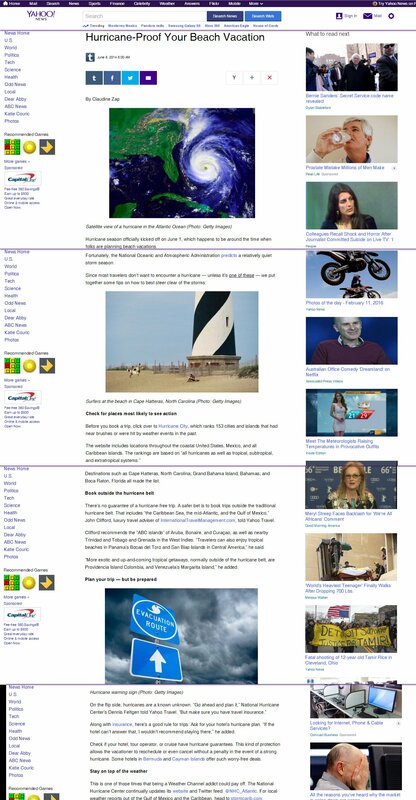 Reuters News mentioned the HurricaneCity rankings for the June 1st, kickoff of the 2009 Hurricane Season. 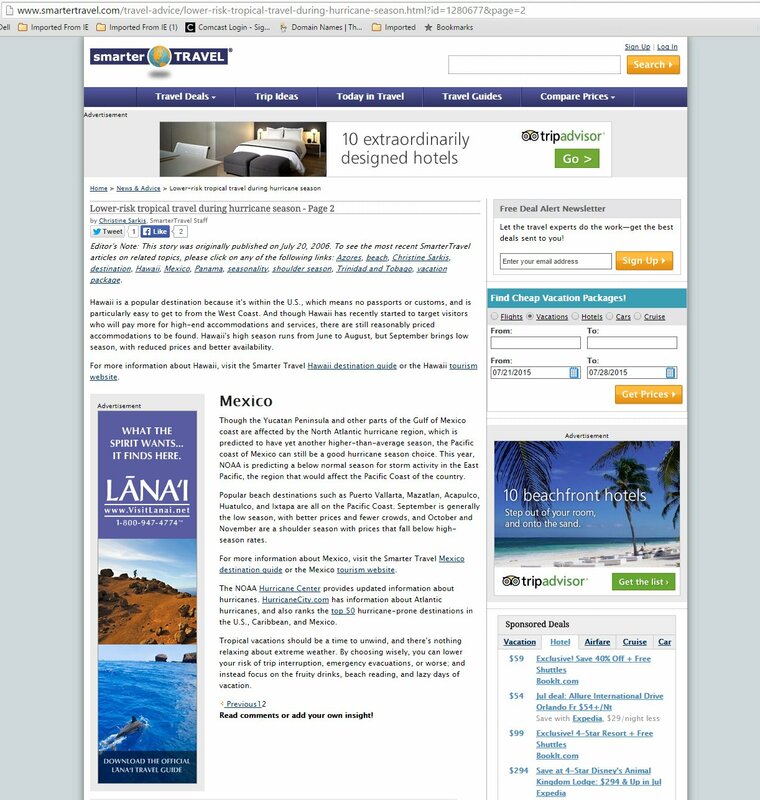 Click the image to right to read the article. Smarter Travel mentioned hurricanecity.com along with the National Hurricane center with HC having a list of the most prone areas. 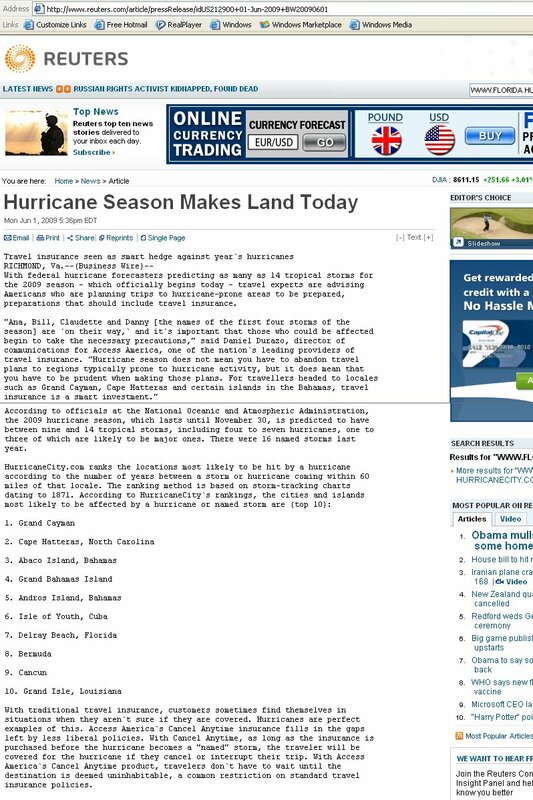 Island of St Croix newspaper did a story in 2005 on hurricane supplication day mentioning hurricanecity.com's database for the islands hurricane past. 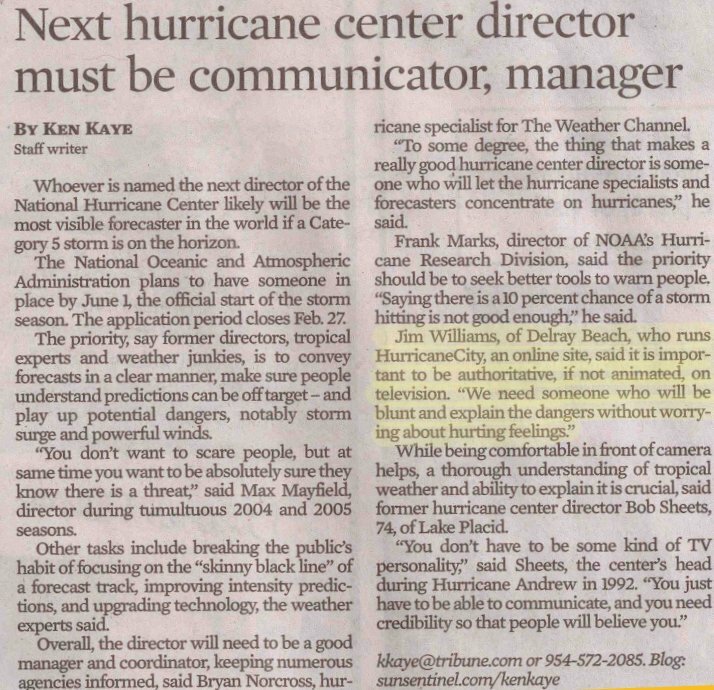 Editor Ken Kaye wrote an article about who should be the next director of the National Hurricane Center in early 2012. Jim Williams of HurricaneCity.com is asked what is the importance of the directors job. An article titled "As hurricane season approaches, a simple question: Are we due?" written by Zachary T Sampson,Times staff writer discusses Tampa Bay being overdue for a hurricane. Mentions Jim Williams historical data and predictions of west coast of Florida impacts for 2015. 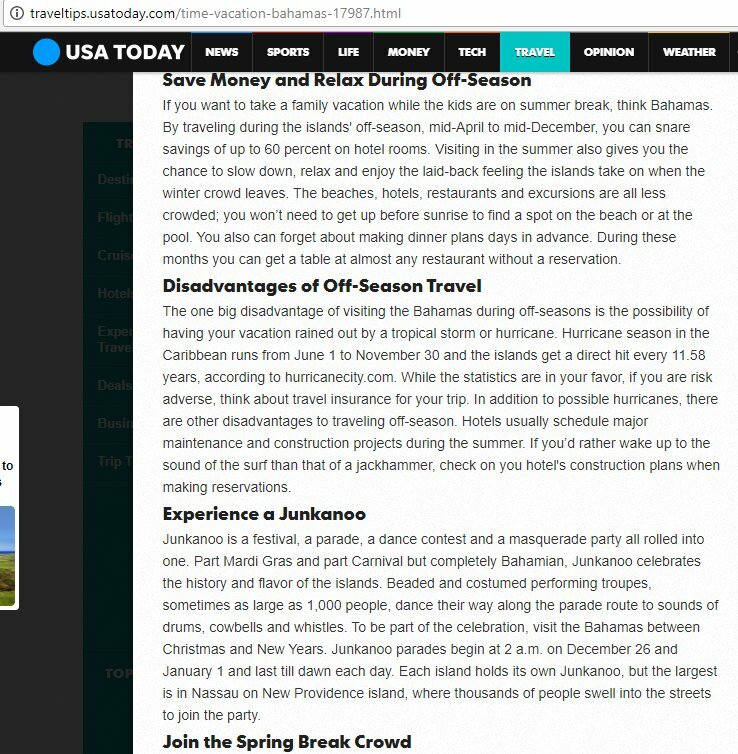 USA Today writer D.L Hughes wrote an article on the best time to vacation in the Bahamas. The statistics posted were wrong it's more like every 2 to 3 years for the Bahamas but we appreciate the mention. A news site called Newsbytes (part of The Washington Post) reviews websites & writer Wendy Woods from Minnesota wrote about HurricaneCity.com on November 7th, 2001. She calls HurricaneCity a "one stop shop" for hurricane info. You can see for yourself a hurricane or tropical storm in action, departing, or approaching on the world wide web. Finally, someone mentioned the true intention of this website. Kenneth Lamb has two radio shows. 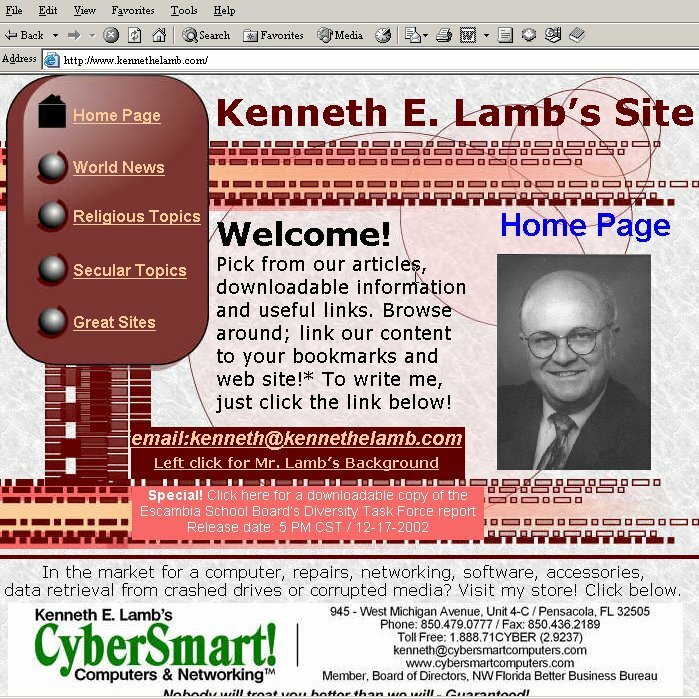 (Cybersmart Saturday and Sunday Morning with Kenneth Lamb). 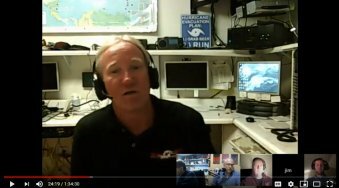 Jim Williams of "HurricaneCity.com" has been a guest on his shows during hurricane threats. The station WCOA in Pensacola reaches from Biloxi, Mississippi all the way to Tampa, Florida. Kenneth Lamb also writes for the Miami Herald, New York Times, Pensacola News Journal & the St. Petersburg Times. This station covers from Alabama to Ft. Walton Beach, Florida. They have great hurricane coverage when they are threatened. On June 11th, 2005 during the approach of Tropical Storm Arlene they linked to HurricaneCity along with the National Hurricane Center. In June of 2014 Claudine Zap wrote a story titled "Hurricane-Proof Your Beach Vacation" where she mentioned the hurricanecity database and how to reference the database when planning a vacation.